Amongst the discarded cigarette packets, empty sweet wrappers and manuscripts underneath Dylan’s desk here at 5 Cwmdonkin Drive you will find a book that had upset Dylan in December 1934. 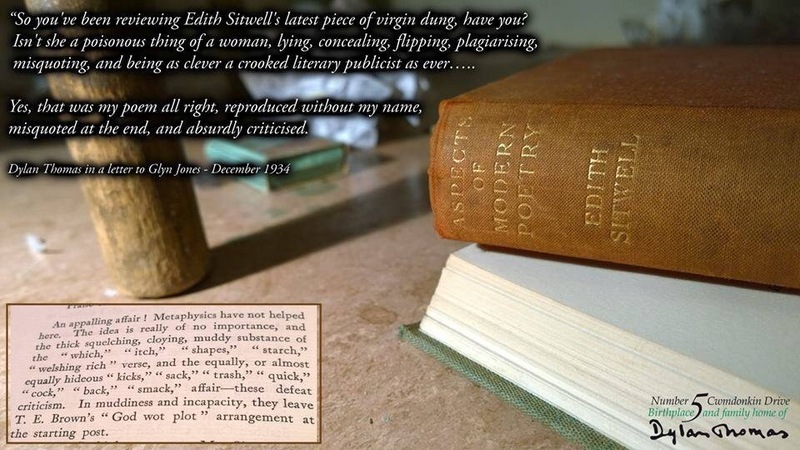 Published by Duckworth in late 1934, Aspects of Modern Poetry by Edith Sitwell was savagely critical of New Verse, a periodical ran by poet, novelist and critic Geoffrey Grigson. In her scathing review she used Dylan’s poem Our Eunoch Dreams, which had been published in New Verse in April 1934 as one of its bad examples. As an added insult she didn’t even mention the author of the piece by name! Take a look at our website www.dylanthomasbirthplace.com for details on how you can create your own unique experiences including tours, overnight stays and dining experiences at the home of Dylan Thomas, Wales’ most renowned writer!